1 Tuner + 1 or more non-Tuner monsters When this card is Synchro Summoned: You can destroy all cards on the field. Once per turn: You can banish 1 Plant-Type monster from your Graveyard, then target 1 Defense Position monster your opponent controls; change that target to face-up Attack Position, and if you do, its ATK becomes 0 until the end of this turn. Black Rose Dragon is #2, and early on in Synchro life long ago, it reigned as #1. Level 7, generic summon requirements. The Plant-based effect everyone forgets about is fantastic. Banish a Plant-Type from your grave to force an opponents monster into attack mode and drop its ATK to 0, that equates to direct damage. Only until the end of the turn, but that monster won’t live to the end of the turn. Onto the boom effect. Synchro Summon of this card equals field wipe if you choose. When first released, this was an insane ability, and still is. Heavy Storm and Dark Hole rolled into one, BRD could be Synchro Summoned more than once per turn and activate this effect. The ability to clear the field is always useful to have at your disposal. 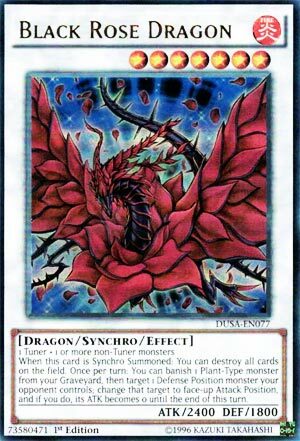 Even as Synchro Summoning has faded in the game, Black Rose Dragon stands as one of the Synchro monsters you think of if you have a Tuner monster in your deck. Blowing up the field can save you, advance your plays if your strategy revolves around the graveyard, and pave the way for a big turn. Black Rose Dragon will always be an option in the game for anyone playing a Tuner. Its devastating ability has been dampened over time, but it still has a crushing ability that can turn the tide of a game with minimal effort. Black Rose Dragon is THE field nuke. BRD is a generic Level 7 Fire Dragon-type Synchro Monster with 2400 Atk and 1800 Def. Any way you can make a Tuner and a non-tuner will get you a Synchro Summon that can destroy all cards on the field. If you want, since technically the effect is not mandatory. Neither is the other effect. If you have plants in your grave, you can banish one to target a def position monster and switch it to face up attack position and make the monster’s attack 0. Black Rose Dragon is still an excellent boss monster for plants because of that effect. It earned the number 2 spot for the first attack being an excellent field clear that doesn’t target and is more easily summoned in more decks than, let’s say Judgement Dragon. Finally, BRD is just fracking beautiful. A card that does warrant a spot on this list, though it does surprise me to see how high it is overall, it does warrant the spot sorta. Originally released in the 2008 Wave 2 Tins (2008 had great tins) we have Black Rose Dragon. BRD is a Level 7 FIRE Dragon Synchro with 2400 ATK and 1800 DEF requiring one Tuner and one or more non-Tuners. Stats are fine for a Level 7, attribute I wish was better, but type is great. When BRD is Synchro Summoned, you can destroy all cards on the field. Yeah, pretty simple yet really amazing. If your opponent has a bigger board with weak protection, this can really wipe them out of the duel for the rest of the game. Plus with easy summoning requirements plus Destrudo making this even easier, BRD is great. Though when it comes to Destrudo, with AFD gone, BRD might not make Extra Deck splashes with Destrudo in the Main Deck until Needlefiber reaches the TCG. The other effect is probably unheard of to most, but once per turn you can banish a Plant from your GY to target a Defense Position monster your opponent controls and swap it to Attack Position and then make its ATK 0 until the end of the turn. If you are playing Plants, this can come in handy to finish the game when your opponent is on the defensive side. BRD is great, mostly due to the first effect she has. Stands the test of time very well. Was limited back in the day though since the lack of Synchros means this was probably played in multiples. Art: 4.5/5 BRD is very pretty. My #2: Brionac, Dragon of the Ice Barrier. Pojo himself said we only had four lists submitted (appropriately given our regular review team) and seeing she missed mine, I must admit to being shocked that Black Rose finds herself so far up here (and equally shocked she’s above Stardust Draogn) but neither of those things are here nor there. She’s harder to use and abuse in the game today, and a little slower compared to what she was and what we have available in the card pool as well, but she could still work in a dedicated Dragon or Plant Deck. The second effect isn’t as powerful, or necessary, one could even argue, as powerful as it can be to drop attack to 0 and force a Monster into attack mode.